The temperature this morning is a chilly minus thirty-five degrees and our windows are all framed with a thick border of frosty ice. I remember when I was a child and frost covered the windows, you couldn’t see through the etched patterns on the glass. I’d place my finger on the ice and watched with fascination as my finger slowly melted a dot, then watched as the warmth of the sun radiated from that dot, melting the frost and slowly widening the view to the outside. Every day I come across a scene or event that is reminiscent of yesterday. When you’re young, every day is a good day and you look forward to the changing seasons. Winter was no exception. Winter meant carnivals, ice-skating and kids playing hockey in their back yard. Winter meant red cheeks, runny noses, chapped wrists from woolly mittens and of course the best hot chocolate you ever tasted. I remember a eight foot toboggan crammed with eight kids sliding down a hill at break neck speed, dodging old maples and oak trees, sliding past the old barn almost two hundred feet before rolling to a stop, spilling its giggling and screaming occupants into the snow. Winter meant snow forts with a cache of snow balls. Winter meant snow ball fights, faces washed with snow and snow angels. Winter meant Christmas with toys, tangerines, nuts and apples. Winter meant Christmas concerts and Christmas carolling under street lights. Winter meant stiff clothes on the clothes line and dripping mitts, snow suits and boots by the stove. Winter meant frosty breath, ruddy cheeks and frozen feet. In winter, evening shadows came early and we’d tumble into the warm yellow glow of the kitchen that greeted us with smells of fresh baked bread mingled with scents from the wood stove and dinner. Winter’s meant Cod-Liver-Oil pills, Vick’s vapour rub and woollen stockings wrapped around our neck when we had a sore throat. At night I remember snuggling down into bed, heavy quilts tucked in around my sides so no draft could find me. Amidst the north wind howling and trees groaning, slumber came quickly to me in that cozy, warm house long ago. Fifty-nine years later, the minus thirty-five degrees tells me global warming hasn’t found my corner of the world yet. Still in my pyjamas, I squint out of the window. The sun is almost blinding as I watched ice crystals shiver across the frozen crust of snow. The naked trees, stiff, their sap congealed with the cold, trembled, swaying side to side protesting the icy winds that cut through them. Although everyone complains about the long winter, there still is a beauty to be appreciated. Rushing winds chase through the boughs of the large Spruce trees lining the driveway. Thick pillows of snow that rested on their outstretched arms, now plops to the ground like dollops of frothy meringue. In the field behind the house the wind sculpted snowy crystals into waves and curls like sand dunes then hastened to the roof where it formed a heavy wave that hangs lopsided down the front of the house like thick cream spilling down, suspended half way to the ground. I sit at the table clutching a cup of hot coffee between both hands and stare at the scene playing out before me. Suddenly a bit of nostalgia grips me and I have an urge to place my hand on the frost and watch it melt, so I can again see the scenes of winters long ago. Thank you for your kind and generous words. I’m sorry I haven’t written sooner. I’ve been fighting a bug since Christmas, I suspect it was one of those super bugs. I think I’ve recovered, but still feel a bit of a cough in the evening. I wish I was a prolific writer, but caring for my daughter, who is quadriplegic leaves little time for writing. Luckily she is doing much better than she was last year and I’ve been able to rejoin with my friends on FB, and am able to write a bit more. I’m so glad you like my articles. You’ve inspired and motivated me. 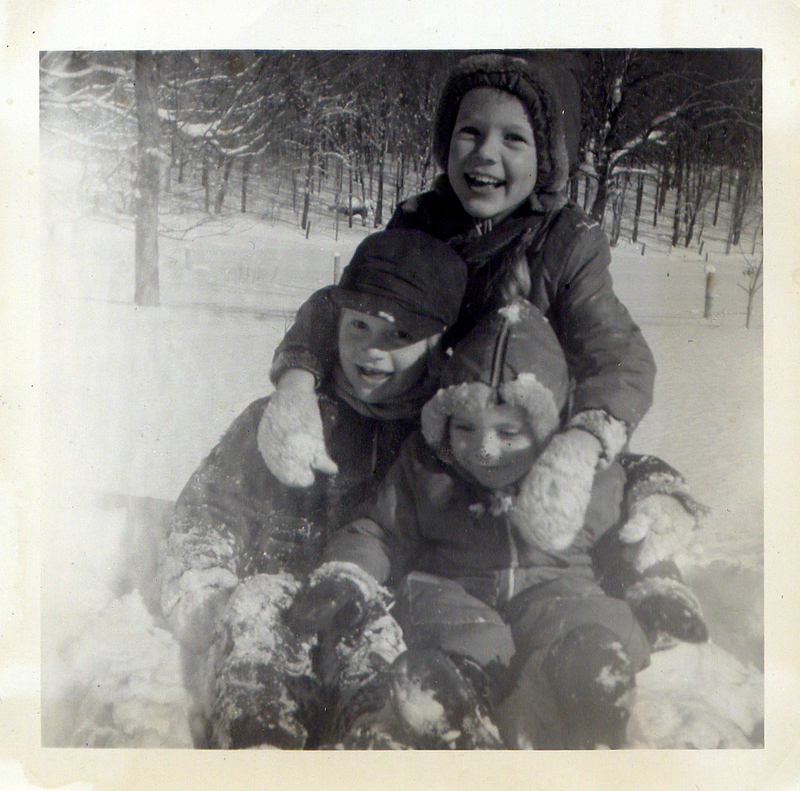 PS; the picture is of myself on top with my two sisters, taken in 1955.